The Safety Culture Assessment is a survey administered across Johns Hopkins Medicine that measures caregiver attitudes related to the climate or culture of safety throughout the organization. The tool provides a snapshot of the overall safety culture in a given work area. I have the support I need from others in this work setting to care for patients. The 2018 Safety Culture Assessment will be open from Monday, Oct. 1, through Wednesday, Nov. 7th. Eligible staff members will receive the survey through their Johns Hopkins email account with a unique URL. Who needs to take the survey? 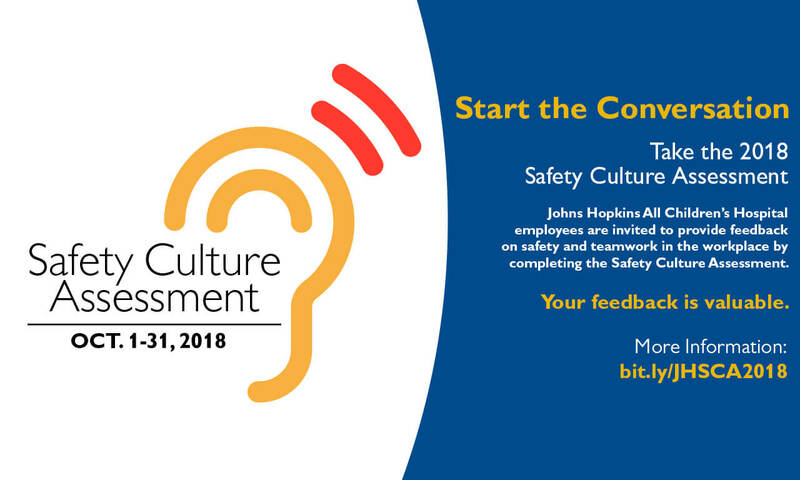 Staff members with responsibilities that directly affect patient care at any Johns Hopkins Medicine member organization will be asked to complete the survey. This includes nurses, physicians, mid-level providers, clinical associates, support associates, technicians, pharmacists, respiratory therapists, social workers, dieticians, rehabilitation therapists and others. Work at one of the following Johns Hopkins Medicine member organizations: The Johns Hopkins Hospital, Johns Hopkins Bayview Medical Center, Howard County General Hospital, Suburban Hospital, Sibley Memorial Hospital, Johns Hopkins All Children’s Hospital, Johns Hopkins Home Care Group, Johns Hopkins Community Physicians, ambulatory surgery centers, Johns Hopkins Regional Physicians or the Johns Hopkins University School of Medicine (practicing physicians only). Work at least 50 percent of the time on a specific unit or clinical area. If the job role is not specific to a particular unit, staff members should answer the survey questions with a particular department or service in mind. For example, worked in the clinical area for at least four weeks. FOR PHYSICIANS ONLY: On average, admit at least two patients per month to the clinical area.